Banaisteoir Síneach agus duine tábhachtach i Réabhlóid Chultúrtha na Síne ab ea Jiang Qing (Sínis: 江青, pinyin: Jiāng Qīng; 19 Márta 1914 – 14 Bealtaine 1991). Faoin ainm Lǐ Shūméng a rugadh í in Zhucheng, Cúige Shandong in oirthear na tíre. Lan Ping (蓝苹) an t-ainm a d'úsáid sí mar aisteoir agus bhí ainmneacha eile uirthi le linn a saoil. An 4ú bhean ag Mao Zedong, Ceannaire Fíorthábhachtach Dhaon-Phoblacht na Síne agus Cathaoirleach Pháirtí Chumannach na Síne, a bhí inti. Phós sí Mao in Yan'an i mí na Samhna, 1938, agus ise Chéadbhean na daonphoblachta i mblianta tosaigh an rialtais cumannaigh. Cuimhnítear uirthi mar gheall ar a ról lárnach le linn na Réabhlóide Chultúrtha agus ar an gcomhcheilg pholaitiúil a chothaigh sí ar a dtugtar Drong an Cheathrair. Roimh bhás Mao, bhí cuid mhór den saol poiblí sa tSín faoi smacht Dhrong an Cheathrair, na meáin agus an bholscaireacht san áireamh. 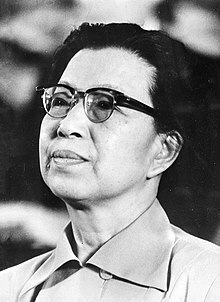 Bhraith cumhacht Jiang Qing ar Mao, agus ba mhinic a bhí sí i gcodarsnacht leis na ceannairí móra eile sa tír. Ba bhuille mhór di agus dá huaillmhianacha é mar sin bás Mao sa bhliain 1976. Rinne Hua Guofeng agus a chomhghleacaithe í a ghabhadh i mí Dheireadh Fómhair den bhliain chéanna agus cháin údaráisí an pháirtí í. Ó shin i leith, tá sé curtha ina leith go hoifigiúil gur bhall í de "Dhrong Fhrithréabhlóideach Lin Biao agus Jiang Qing". Cuireadh an locht ar an drong sin as an damáiste agus scriosadh a rinneadh sa Réabhlóid Chultúrtha. Daoradh chun báis í ach iomalartaíodh an breithiúnas sin go príosúnacht saoil sa bhliain 1983. Scaoileadh í i gcomhair chóiriú leighis, ach chuir sí lámh ina bhás féin i mí na Bealtaine sa bhliain 1991. ↑ Stefan R. Landsberger (2008). "Madame Mao: Sharing Power with the Chairman". Tugadh an leathanach seo cothrom le dáta an 8 Meitheamh 2016 ag 20:37.